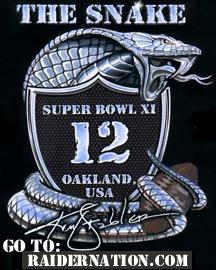 The snake design came about based upon the popularity of Ken Stabler who came to be identified as “The Snake”. Early in the evolution of Raider Nation I opened discussions with representatives of Stabler and, eventually, with Stabler himself. He was developing a presence on the internet and I thought there might be some synergy to be gained if we could team together on a design that he endorsed. The original concept is pictured here with the website Snakes Place incorporated, this was Stabler’s site. Let’s just say that we could not come to terms on pricing strategy and I pulled out of the deal. The idea was good enough, however, to move forward without incorporating any references to Stabler, a generic Raider Nation t-shirt which turn out to be as killer as the original design. But now you have a little bit of insider history on what went into the designs development and what could have been – see below. Lovely isn’t it? Too bad it never went into production as originally designed since I am not inclined to be sued for infringement and no agreement could be reached. In my opinion, very short sighted on The Snakes part as this would have been a marketing gold mine for him and establish his place among a new generation of fans. Alas, it was not meant to be. All was not lost however as the design went on to become a top seller and solidified its place in Raider Nation history. Of course, it never hurts to have Raiderettes modeling your designs!! Lessons learned: don’t be short sighted with your marketing. Look to the long term to capitalize on success, what cost you now will come back to yield dividends in the future. 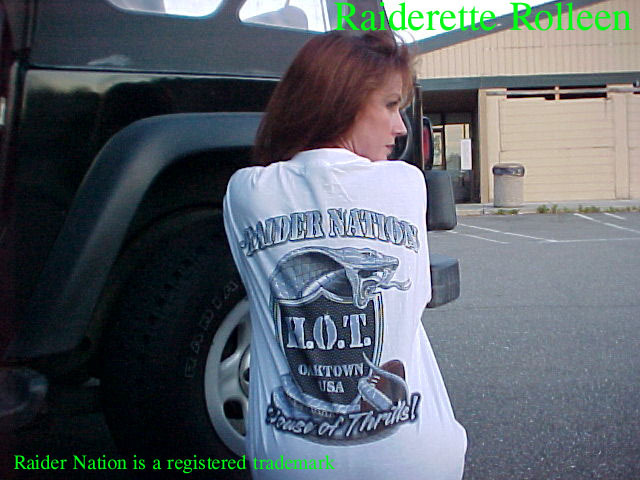 All photos are exclusive to the original Raider Nation website.